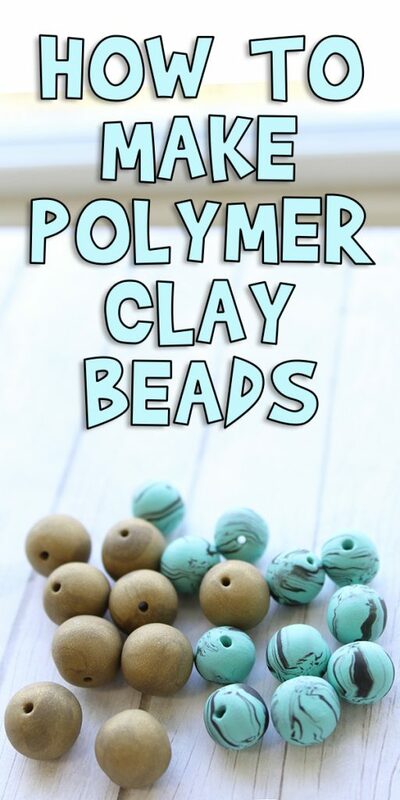 I’m so excited to show you all How to Make Polymer Clay Beads today! These are so much fun to make and the designs are endless. 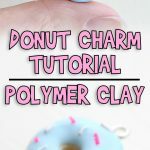 If you haven’t worked with polymer clay before, make sure to check out my Introduction to Polymer Clay post for the basics and some tips! 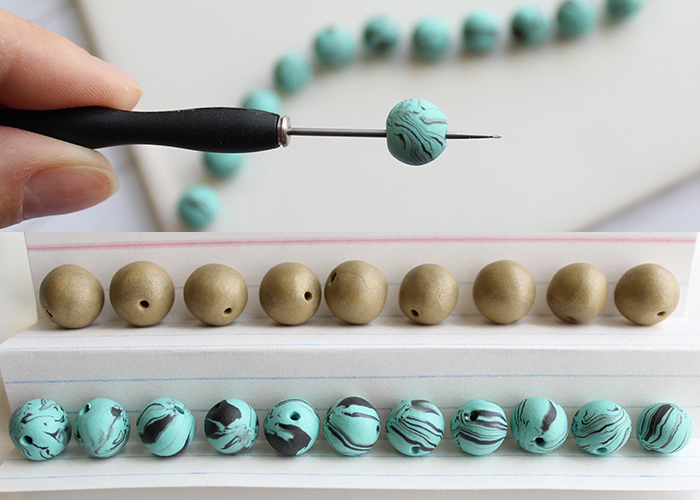 Today I’m going to show you how to make both basic and marbled beads, so let’s get started! Plain copy paper or an index card. Folded accordion style. Gold clay. Or whatever color you want for your plain beads. Teal and black clay. 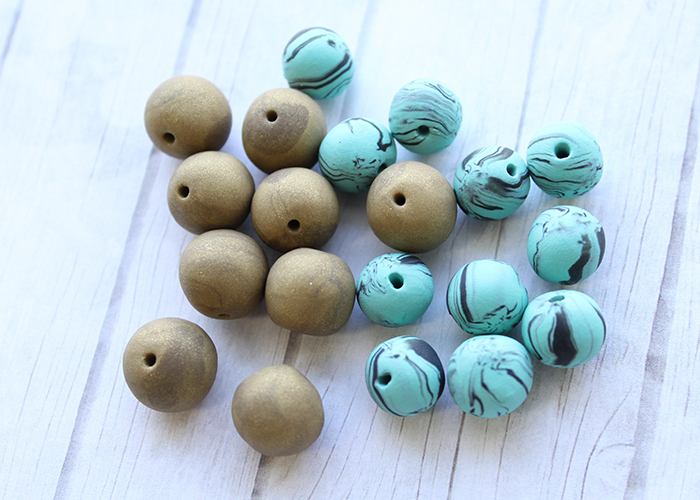 Or whatever two colors you want for your marbled beads. Blade or plastic cutting tool. 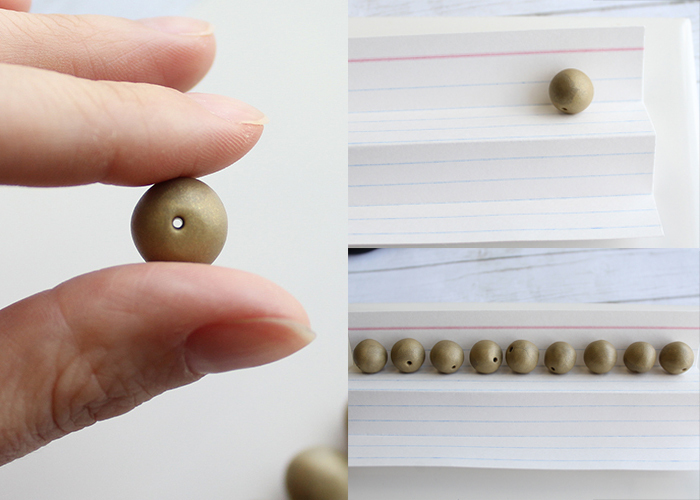 Let’s make the plain gold beads first. 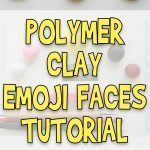 Start by rolling your clay into a ball, then into a snake. Use your blade to cut the snake into equal sections. 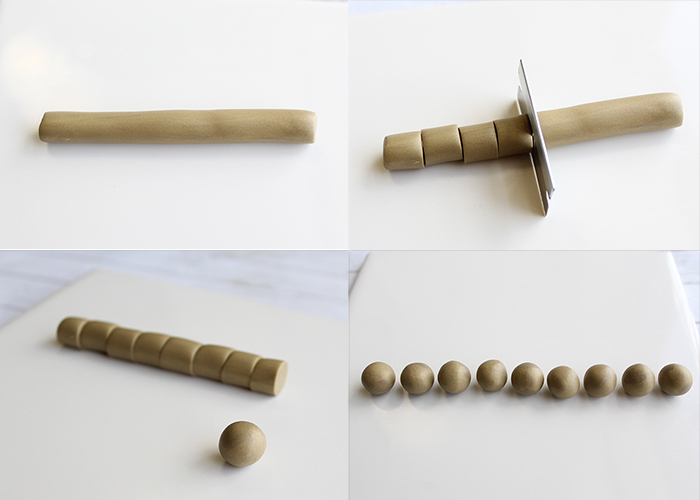 Roll each section into a ball using the palms of your hands. Now take your needle tool, and push it straight down through the center of your bead. Pick it up on the tool, and gently rotate the bead until the tool goes through to the other side. Remove the needle, and push it in gently from the other side. 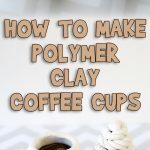 This create a clean hole all the way through the clay. If you mess up the first time, don’t worry! Just re-roll the clay into a ball and try again! See how neat and clean going in both sides makes the hole? 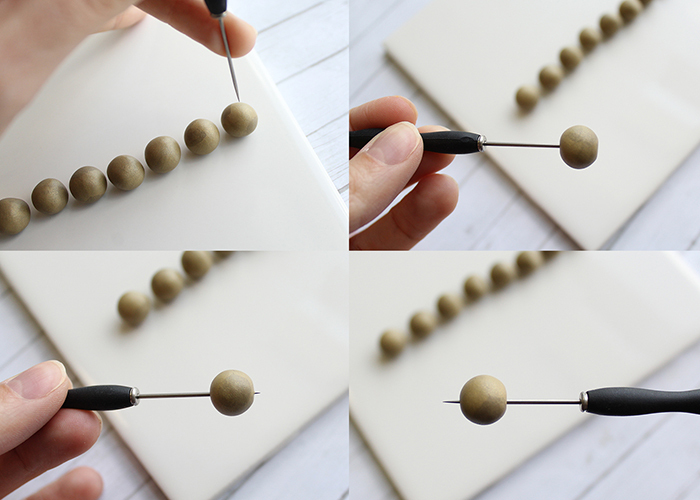 This helps you be able to more easily string the beads on thread later. When you finish each bead, set it into one of the channels in the accordion folded paper. Using the folded paper to hold the beads while they bake keep them from having any flat or shiny spots. Now, let’s make our marbled beads. Take your two colors. If you’re using a darker and a lighter color, I recommend using less of the darker color for a balanced look. Roll out each color into a long snake. Then twist them together. Fold this twist in half, and twist it again. Repeat this two or three times until your colors are well blended. Do not mash, knead, or squeeze the clay. That will cause the colors to mix and become a new color rather than marbleizing. 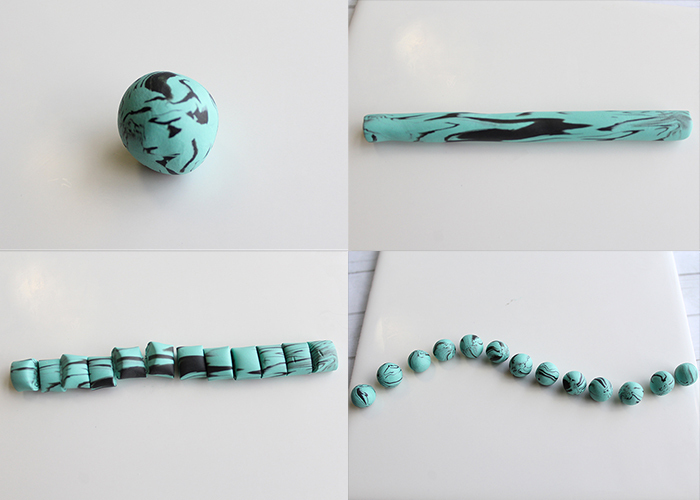 When you’re happy with your marbleizing, go ahead and roll your clay into a ball, then out into a snake. Cut it into equal portions, and roll it into balls like you did for the gold beads. 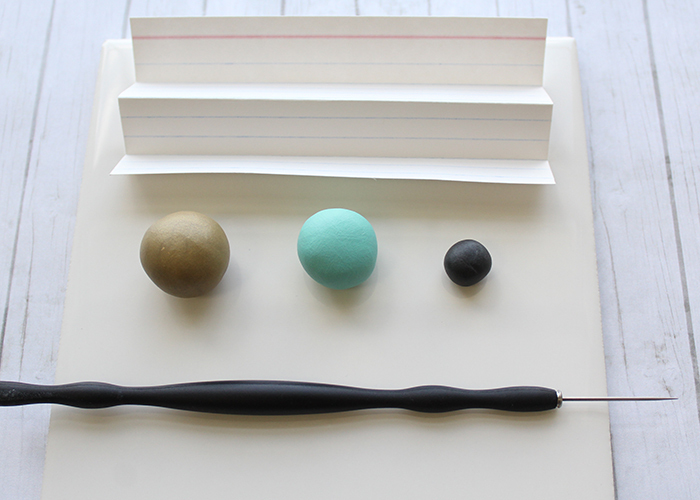 Go ahead and create the bead holes the same way, and add your marbleized beads to your folded paper. Bake them according to your clay manufacturer’s instructions. I used Sculpey clay and my beads were just above 1/4 inch thick, so I baked mine at 275 F for 30 minutes and they turned out great! Here are the gold beads. 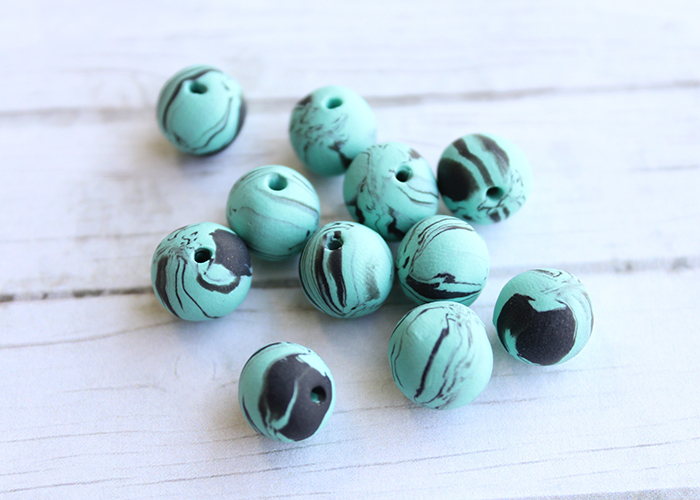 And here are the marbleized beads. 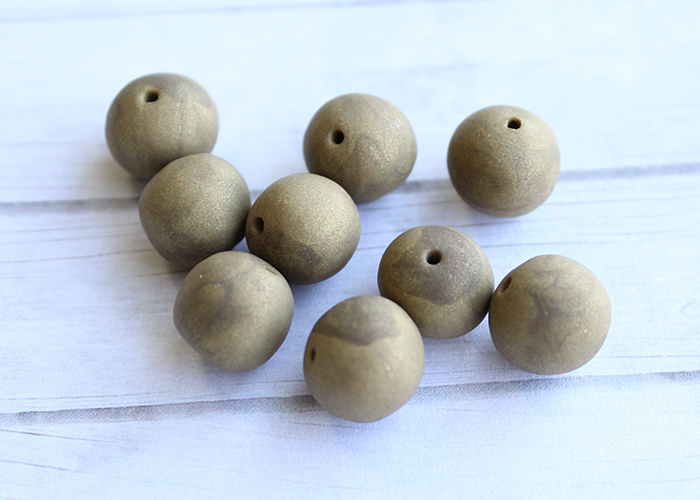 I prefer not to coat my polymer clay projects, but if you want your beads to have a shiny finish, I recommend using a polyurethane sealer on them for the most durable glossy finish! 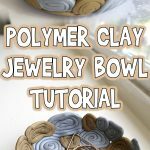 I hope you enjoyed learning how to make polymer clay beads with me! Ages 6-8, Ages 9-12, For Teens, Wearable Crafts	Joanna Brooks	beads, how to, jewelry, polymer clay, wearable crafts.